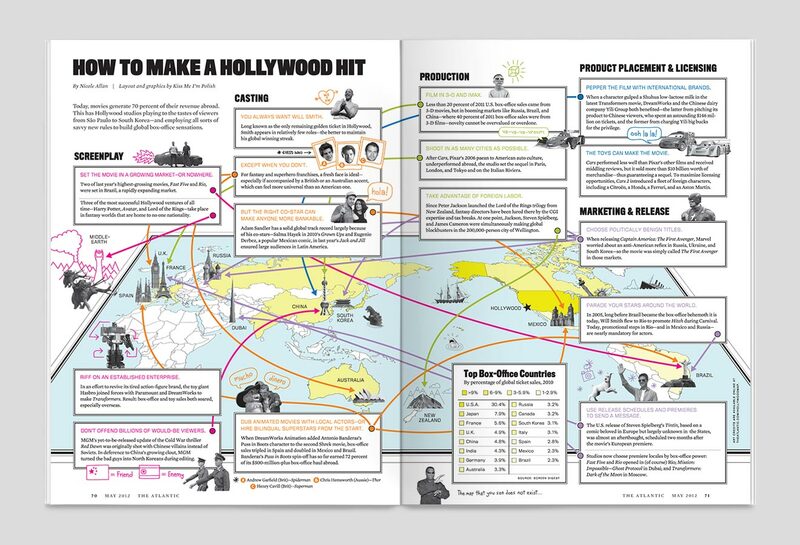 In late February, The Atlantic approached KMIP to illustrate a full spread information graphic to appear in their May 2012 issue for an article title “How To Make a Hollywood Hit.” The narrative guides us through a set of savvy, unofficial rules that Hollywood employs to build and secure a global box-office hit (and bring in the dough). Suffice to say, the movie junkie in us was thrilled with this assignment. Partly because the complex heavy data sets we usually work with took on the form of Will Smith, 3-D glasses, and worlds that don’t really exist. Score! So to make the most of this type of non-numerical data, we created a map that takes the viewer to all corners of the world (and in some instances, beyond). Not sure what we mean? Let’s just say that we not-so-stealthily snuck in some rather geeky iconic movie references – Where’s Waldo style. Think: Jaws, Planet of the Apes, The Matrix, and more. The May issue is now available on newsstands, so pick up a copy for yourself and nerd out with us. For those of you who prefer to do things on the web, there’s a downloadable PDF available on The Atlantic website.